Combine the sugar with the cornstarch, salt, and water in a saucepan. Add 3 cups of blueberries, stir together, and bring to a boil, cooking for 2 minutes until it has thickened. 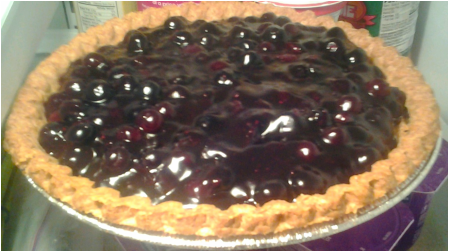 Off the heat, add margarine or butter and lemon juice, then stir in 2 more cups of fresh blueberries and pack into pie shell. Chill until firm. You can also make a tasty pie out of all fresh berries. You just make a sugar-and-water-and-cornstarch glaze, put the fresh berries into the pie crust, and pour the glaze over them, then chill to set.